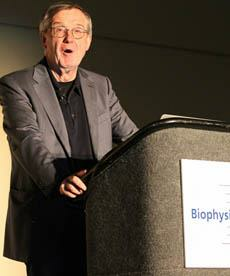 On February 9, 2015 Klaus Schulten delivered the National Lecture at the 59th Annual Meeting of the Biophysical Society in Baltimore. This is the highest award given each year by the Biophysical Society. The topic of Schulten's talk was “Discoveries in Biophysics Through the Computational Microscope”. The Lecture, in which Schulten stressed that computation is now a tool for discovery, encompassed systems ranging from individual proteins, to larger complexes like the ribosome and the HIV virus capsid, all the way to a massive molecular machine––the photosynthetic chromatophore.